Saudi Arabia, in the Southern part of the Middle East, has a population of about 28 millions people (07/2007), stretches on 2,200,000 km on most of the Arab Peninsula. Almost all the population is Sunnite Muslims but there is a small minority of Shiite Muslims in the South-West on the border with Yemen. Present Saudi Arabia was created in 1926, when the Ibn Saud tribe from the East took over the current territory of Saudi Arabia, after two centuries of ongoing struggle with the Ibn Rashids, their main opponents. The kingdom was recognized by the most important super power at that time in the region – UK, in 1927. The Ibn Saud are the standard-bearer of the strict Islamic version of Wahhabism and Saudi Arabia is still ruled by the Ibn Saud tribe. The constitution of Saudi Arabia is the Quraân and the judicial system is judging according to the Sharia – the literature of Quraan interpretation. 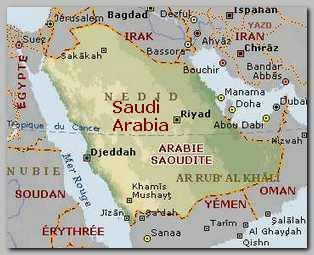 Some Muslims calls Saudi Arabia “The Lands of The Two Holy Places” referring to Mecca and Medina. Non Muslims cannot be citizens of Saudi Arabia. Saudi Arabia is the richest country in the world in oil aquifers. The influence of Saudi Arabia on the Arab and Islamic world grows in accordance to the importance of oil in Global economy. After the 1973 war between Israel and the Arabs and the Oil embargo – Saudi Arabia became a very rich country with huge money reserves. A part of the money was invested in the Muslim world all over the globe in Islamic education and new Islamic schools (Madrassas). The enormous Islamic education system funded by Saudi Arabia teaches, naturally, the strict version of Islam – the Wahhabism. Saudi Arabia became, unintentionally, the main source of Radical Islamic education that feed the Global Jihad. *Saudi Arabia was an ally to the West, the UK and later USA, and needs their support in order to protect its huge reserves of oil and its large territory. On one hand Saudi Arabia depends heavily on Western technology, while, on the other hand, the presence of non Muslims technicians in large numbers and foreign non Muslims soldiers on the soil of Saudi Arabia is a disgrace to radical Islamists. * The Saudi elite is, economically, strongly connected to the Western countries and the Western cultural influence contradict the values of strict Islam. * Although the country is rich in oil and provides good education to its citizens, the technological infrastructure is in the hand of foreign companies and the Saudi economy cannot provide enough well paid jobs to the young Saudi generation. The foreign Western companies and the corrupted royal family are considered to be responsible for this situation. As in all radical groups, in the human society, the opposition comes, generally, from the more radical who opposed any compromise, which is very often, the necessity of life. Saudi Arabia exports, through Islamic education, radical interpretation of Islam and young frustrated Muslims, to Jihad all over the world. Saudi Arabia also has to confront a radical Islamic opposition inside the country which threatens the stability of the country, the Ibn Saud royal family and the richest oil reserves in the world.